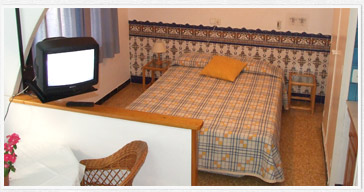 Your best choice for your stay in Sitges throughout the year. Sitges is a city offering cultural activities and festive celebrations throughout every month of the year and the Montserrat studios, thanks to their prime location, will allow you to enjoy these events with complete independence on any day of the year. Our studios are self-contained spaces ideal for couples or small groups, with a bedroom, bathroom, dining area/lounge/kitchen, TV, adjustable air-conditioning (cold - hot). The best location! (see location and map). Montserrat Apartments, located in the center of the city, just metres from the district for night life, museums, old quarter, commercial district, very near the beach, and close to the train station and the bus stop for the airport, whilst also being on a peaceful street. Check the prices of our apartments online.